Memo: If I Were In Charge….. Note: This is evidence why it’s a bad idea to put me in charge of anything. Hi, guys. I need to talk to a web developer. We’ve got a little bug in the code on the Hello Poetry site. Our pages are telling readers to submit “suggestions” on a mouse-over of the little pencil icon. 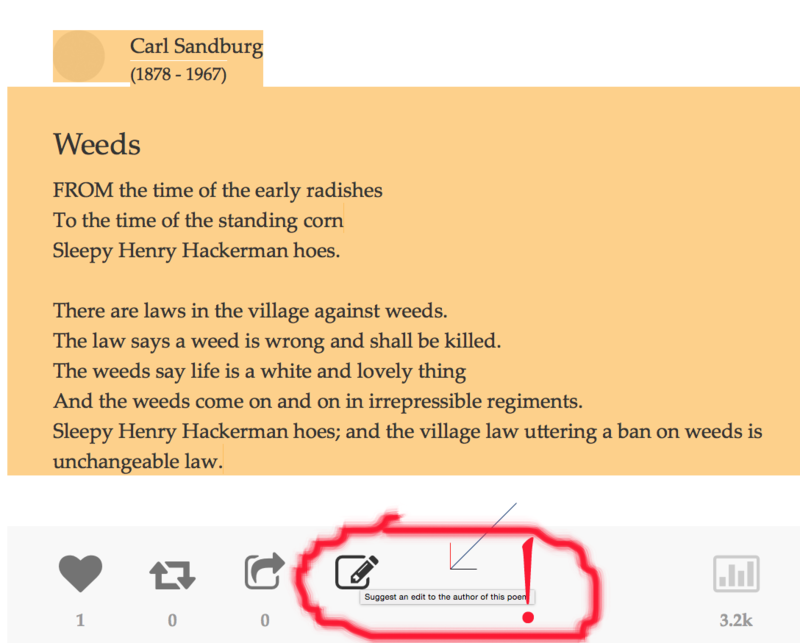 To Carl Sandburg, in this example. Of all people. I know….Yes, none of us, including me, saw the problem when we OK’d the final design. No fingers are being pointed. However, now that I see it, live, next to Sandburg’s name, and others, it doesn’t seem like our finest move. He’s been dead for several decades—30 years before the Internet—for one thing, so there’s little chance he’s going to get any emails. For another, he won three Pulitzers, and we haven’t won any, nor have our readers, as far as we know. And he probably wrote a couple of million poems. Let’s quietly disable that feature before writers everywhere see it and say mean things about us on their blogs. You know what drama kings and queens they are …..
Next PostNext The Scariest Moment: A Huge Thank You to Y’all.